In the world of Web 2.0 and social networking “open” is the new black; it’s the “it” trend. On the same day that Yahoo shook hands with Google and MySpace to join their Open Social programming specification, and the same day Microsoft announced a broad data portability pact with 5 other social networks, digital music network iMeem announced they were launching an open platform of their own. The iMeem service, dubbed a “Media Platform” aims to go further than other offerings. Whereas Open Social is a common set of programming interfaces developed by Google to allow interoperability among member social networks, the iMeem Media Platform includes both an application programming interface (API) and access to client libraries. The libraries unlock access to music, photos, videos and member profiles available through the site and service. There is also a fully customizable media player available. That access does add a unique and powerful twist. It empowers developers to build anything from music tools like recommendation agents, or online radio players, to customized playlists, anything they can think of – and better yet, it empowers them to do it without having to pay royalties for access to the content. 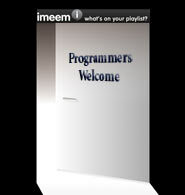 Supporting the announcement, Imeem has also launched a new developers’ Web site at http://www.imeem.com/developers.